Figure 1. The descent towards Shaheru crater. In June 2017, the BIRA-IASB UV-Vis DOAS group participated in a 12 day scientific measurement campaign in and around the main crater of the Nyiragongo volcano (in the Virunga Volcanic Province, Democratic Republic of Congo) as part of a BBC documentary expedition. The aim of the campaign was to collect scientific data with different types of instruments (seismic, infrasound detectors, temperature data loggers, weather stations, and several types of cameras) in order to better understand the physical mechanisms that drive volcanic processes in the region. This multidisciplinary campaign included 15 scientists from ECGS, EPIC, BSU, GVO, KMMA-MRAC, ULg/UH and BIRA-IASB. Figure 2. 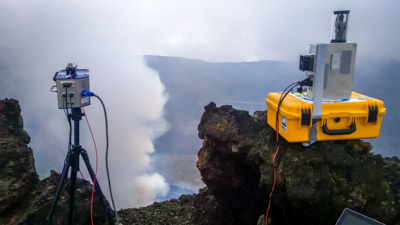 The UV-camera (left) and the DOAS instrument overlooking the Nyiragongo crater. BIRA-IASB was part of the team and contributed with several instruments for quantifying the amount of sulphur dioxide (SO2) emitted by the volcano. 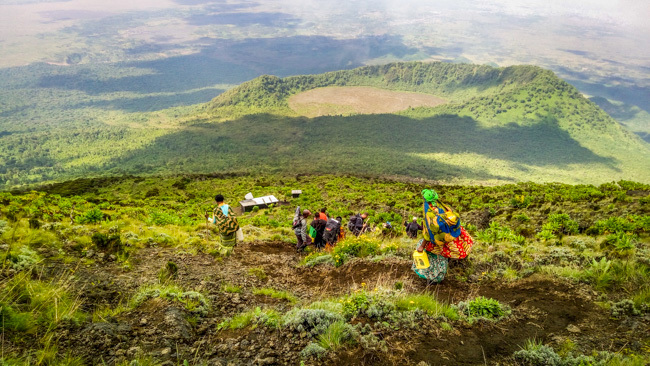 Helped by scientists from the local volcanic observatory GVO and porters from Kiabati village, Hugues Brenot from BIRA-IASB operated a UV camera (Envicam3), alternating between the Shaheru crater (900 m down the summit of Nyiragongo) and the rim of the Nyiragongo crater. The imagery data was complemented with simultaneous measurements by a scanning DOAS device (provided by NILU) and a spectrometer (pointing towards the center of the image). Figure 3. 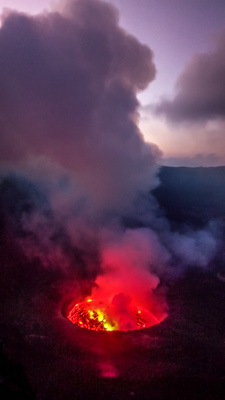 The Nyiragongo crater hosts a permanent lava lake. During the campaign, the scientists often had to work in extreme conditions and the meteorological conditions also limited the possibility to see the whole plume from the surrounding locations. The figure below presents an example of measurements (preliminary results) from the UV camera under favorable conditions. In the coming months, research will be conducted to extract the most relevant information from the SO2 measurements under various conditions and observation geometries, by exploiting the complementarity of the UV imagery and the scanning DOAS observations. The ultimate objective is to build a high-quality SO2 flux dataset for the whole campaign duration, that can be confronted to other measurement types (e.g. infrasound) acquired during the campaign. Figure 4. False colour image of the SO2 clouds from the crater, as detected by the UV-camera. The RESIST STEREO project, funded by BELSPO, contributes to the understanding of the source mechanisms driving volcanic eruptions and landslides in the Kivu Basin region, on the eastside of Democratic Republic of Congo. In this project, BIRA-IASB is leading a work-package about measurements of volcanic SO2 emissions by volcanoes. The SO2 flux is estimated by a combination of satellite instruments and UV camera deployed on the ground. BIRA-IASB would like to thank the RESIST project and the BBC for their indispensable support in realising the Nyiragongo expedition.